Sanango forms a small tree, c. 15 m tall, with very hard wood. The genus contains only one species, S. racemosum which has also been called S. durum. It is found only in Peru, in forests between 300 m and 750 m in altitude. This enigmatic monotypic genus, previously placed in other families including Loganiaceae, Buddlejaceae and Scrophulariaceae, has recently been assigned to Gesneriaceae by some authors, who in a joint project investigated the genus in anatomical, chemical and molecular respects (Dickison 1994, Jensen 1994, Norman 1994, Wiehler 1994, Smith & al. 1994). 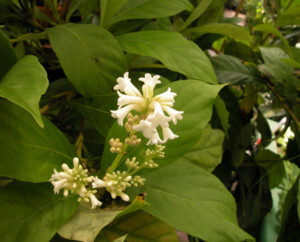 The placement envisaged by Wiehler (tribe Gesnerieae), was weakly supported by the characters and required confirmation. Recent molecular and DNA studies have confirmed Sanango’s placement within the Gesneriaceae, in its own mono-specific sub-family. Sources (adapted): Genera of Gesneriaceae and the article “Gesneriaceae: A Scientific Perspective” on this website.